A collection of firsthand stories documenting selected shards of time written and illustrated by F.T. Rea. Notes by Rebus. All rights reserved. Note from Rebus: The clipping above is from Throttle magazine's July 1982 issue. And, with this project, Rea got his wish. In dramatizing the issue, no doubt, he had "some fun with it." In 1982 the City of Richmond tweaked its City Code to crack down on the posting of unauthorized messages on fixtures in the public way. With a focus on the Fan District, policemen pulled handbills from utility poles and charged who they held responsible for posting them with violating the new statutes. On June 28 of that same year, David Stover, a photographer and an usher at the Biograph Theatre, was ordered by a General District Court judge, R.W. Duling, to pay a $25 fine. Stover’s misdemeanor conviction stemmed from promoting a gig for his band, The Prevaricators. He admitted to having stapled copies of a letter-sized promotional flier to utility poles. In the weeks before Stover’s court date others in bands had been fined for committing the same crime. In the early-80s Richmond’s live music scene was probably the strongest it had been in decades, but the crackdown suddenly had most clubs and bands afraid to rely on handbill campaigns to promote their shows. As fliers were the main promotional tool for most of the rock 'n' roll shows the crackdown threatened to throw a wet blanket over the aforementioned live music scene. As the manager of the Biograph, I had been using the same sort of handbills on a regular basis for 10 years to promote that repertory cinema’s fare, in particular the midnight shows. Xerography had made the cost of a short run of little posters much more affordable. So, I wasn’t about to give up such a reliable and inexpensive method of promotion without a fight. It felt to me like the City of Richmond was not only trampling on my freedom of speech rights, but it was trying to destroy the nightlife scene the Biograph was part of in the Fan District. The local authorities appeared to be trying to scrub away what some in Richmond had come to see as an undesirable element -- much of which they associated with VCU. Given those thoughts, I decided to go on stapling fliers to utility poles, more or less to invite a bust. It wasn’t long before a polite cop showed up at the Biograph with a flier for “The Atomic Café,” the movie we were playing. He said he had removed it from a pole in the neighborhood. I admitted to putting it up and was issued a summons. Due to procedural delays, it took over four months for my day in court to arrive. Which was fortunate, because I used that time window to build my case. In a larger sense, it was another battle in a conflict which had been dragging on since the late-1960s. The crackdown was blowback from the resentment some property owners in the Fan felt toward VCU’s growing presence. In 1982 the look associated with Punk Rock -- how the kids dressed, as well as their art -- was just as off-putting to some conservative old folks and Yuppies as the amplified sound of the music, itself. Consequently, the Fan District Association of that era was dead set against irreverent handbills that promoted edgy happenings in the Fan. Prompted by that civic association’s pressure, the City of Richmond said the whole brouhaha was about trash -- fliers stapled to poles were officially branded as litter. So, I started reading about similar situations in other places, cases that involved using fixtures in the public way, such as utility poles. I found some useful precedents that backed up my thinking. Plus, I began to read about and look at political art and outlaw art, down through history, more than ever. The study of laws and decisions about free speech and the use of public property became my obsession. Scheming about how to present the argument filled my head for the next four months. First, I wanted the court to see an essential context -- our society tolerates all sorts of signage on utility poles, because the messages are considered useful and the practice works. Then, I wanted to convince a judge that once you considered all the handbills in the neighborhood around VCU, as a whole, it could be seen as an information system. It was a system that some young people were relying on for information, just the same as others might rely on newspapers obtained from a box sitting on public sidewalk. After all, what right did the newspaper company have to block the public sidewalk with its box full of information, including a lot of advertising? What allowed for that? One person might read the entertainment section in a local newspaper. Another person might look to the utility poles in their neighborhood, to read the posters touting live music shows or poetry readings. Some would trust the information found in a newspaper. Others might put more faith in the handbills posted on certain poles they walk past regularly. The only reason privately owned utility poles had ever been allowed to impose on public property, in the first place, was that electricity and telephone lines had been seen as serving the commonweal. So, why not use the bottom of the same poles as kiosks? Somewhere along the line, I told my bosses it would cost them nothing in legal fees. A couple of my friends who were on the theater's softball team, who were also pretty good lawyers, would handle the defense. To gather plenty of good examples of handbills to use as evidence, we had an art show at the Biograph (see flier above). On October 5, some 450 flyers, posted on black foam core panels, were hung in the theater’s lobby. In all, there were at least three or four dozen different artists represented. A group of friends acted as impromptu art expert judges to select the best five of the show. Naturally, there was a keg of beer on hand to grease the wheels of progress. Two of the handbill art show judges from that night also served as expert witnesses at the trial. They were: Gerald Donato and David Manning White. Donato was an art professor at VCU; White was the retired head of the mass communications department at VCU. The best 100 of the handbills from the show were later taken to court as evidence. One of Phil Trumbo’s Orthotones (later Orthotonics) handbills was named Best in Show. Most people who knew much about the handbill artists in the Fan would have said Trumbo was top dog, so it was a popular decision by the judges. Thus, on November 5, 1982, I witnessed a fascinating scene in which an age-old question — what is art? — was hashed out in front of a patient judge, who seemed to thoroughly enjoy the parade of exhibits and witnesses the defense attorneys put before him. The room was packed with observers, which included plenty of gypsy musicians, film buffs and art students wearing paint-speckled dungarees. Trumbo testified at the trial as a handbill expert, to explain how to make a handbill and why they were used by promoters of entertainment. He also described how the music and art associated with the bands and clubs were all part of the same scene that flowed out of the neighborhood's university. The judge was reminded that history-wise, handbills predate newspapers. Furthermore, we asserted that some of the cheaply printed posters, a natural byproduct of having a university with a burgeoning art school in the neighborhood, were worthwhile art. The stubborn prosecutor grumbled, reasserting that it was no better than trash in the gutter. Having grown weary of the artsy, high-brow vernacular being slung around by the witnesses, the prosecutor tried one last time to make Donato look foolish. Donato’s punch line was perfectly delivered. The courtroom erupted into laughter. Even the judge had to fight off a smile. The crestfallen prosecutor gave up; he had lost the case. Although I got a kick out of the crack, too, I’ve always thought the City’s mouthpiece missed an opportunity to hit the ball back across the net. A smarter lawyer could well have exploited that angle. Still, the prosecutor’s premise/strategy that an expert witness could be compelled to rise up to brand a handbill for a movie, a green piece of paper with black ink on it, as “un-art” was absurd. So, Donato, who was a wily artist if there ever was one, probably would have one-upped the buttoned-down lawyer, no matter what. Perhaps the question should not have been — how can you tell fake art from real art? Any town is full of bad art, mediocre art and good art. Name your poison. The better question to ask is whether the art is pleasing to the eye, thought-provoking or useful. Then you become the expert witness. However, when it comes to great art, it still depends on who tips the can over. The next day the story about winning the handbill case was draped stylishly across the top of the front page of the Richmond Times-Dispatch. Though the case has ended, the fallout from “The Atomic Café” may not be over. …The case concerned the seemingly simple issue of the allegedly illegal posting of a handbill. But before it was over, the proceedings touched on topics that included free speech, soup cans, and nuclear energy, and invoked the names of such diverse personalities as Andy Warhol and the city‘s public safety director. …“The city, GRTC, VCU, churches, the Boys Club and all the candidates use the public’s utility poles to post their signs. They know as well as the general public that there is nothing pretty about a naked pole. Handbills pose no danger to anyone. Is free speech only for some?” Rea asked in a handbill he had printed up before yesterday’s trial. Terry Rea, manager of the Biograph Theatre in Richmond, was charged in June with obstructing a city sidewalk when he posted handbills on utility poles in the Fan District. Rea’s attorneys, eliciting testimony on mass media and art from several professors at Virginia Commonwealth University, argued yesterday that the city law limited their client’s freedom of speech. However, Richmond General District Judge Jose R. Davila, Jr., said the issue came down to whether the posters obstructed the public way, and he ruled that the commonwealth’s attorney’s office failed to prove they did. Davila dismissed the charge against the manager of the theater but stopped short of finding the city law unconstitutional, which also had been requested by Rea’s attorney’s. The city now must decide whether to find a better legal argument to defend the city law or to revise it, officials said. The law is used by the police to combat excessive advertising in the public way, which is defined as any place open to the public, such as a street or sidewalk. For the last year, Fan District residents have complained to police about the the unsightliness caused by posters on trees and utility poles, Millikin said. The police asked businesses in June to stop posting the handbills and most businesses did so, he said. 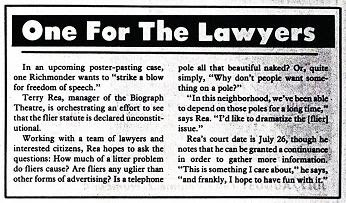 Rea’s attorneys, Stuart R. Kaplan and John G. Colan, contended in court that the posters did not obstruct the public way, and the arresting officer agreed with them. “It was nothing anyone would trip over,” Patrolman James P. Gilliam said about the posters. The attorneys also argued that the city law abridged Rea’s freedom of speech by denying him one possible way to advertise. David M. White, a former VCU professor of mass communication and author of 20 books on the media. 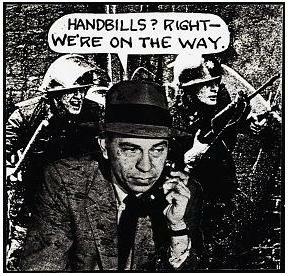 said handbills are a unique form of communication. The theater could advertise in newspapers but the cost was prohibitive, he said. Jerry Donato, an associate VCU professor of fine arts, said that posters in the Fan District contained both art and messages. “The Atomic Cafe” posters, which contained the slogan, “A hot spot in a Cold War,” criticized the use of nuclear power, he said. The courtroom, which held about 30 artists and supporters of the theater, erupted into laughter. Bray said purpose of the statute was to prevent littering but agreed that another reason was to prevent obstruction of the public way. The posting of handbills could block the public way by falling off of a utility pole and causing pedestrians to slip, he said. The posting of the advertisements caused a hardship for the police, which sometimes had to take down the posters, Millikin said. Rea and his attorneys said they were happy with the decision although they wished Davila had gone farther and ruled the city law unconstitutional. That message was printed on a handbill. In 1985, Richmond once again passed new laws forbidding unauthorized fliers on utility poles. Another crackdown ensued. This time it spawned a reaction from several of the Fan District’s handbill artists, musicians and promoters. 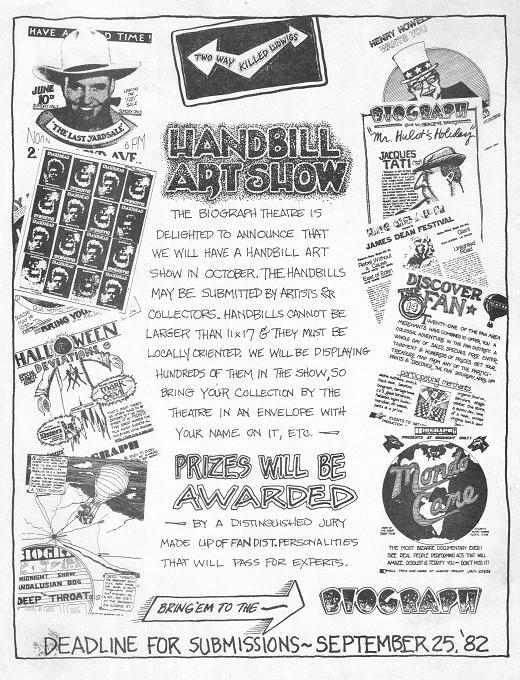 The Fan Handbill Association was what they called themselves. Eventually, this issue prompted me to design a twice-a-week two-page magazine, SLANT, made to be stapled to utility poles. There were cartoons, stories and ads. But that’s another story for another day. I wrote a back page for Style Weekly and was arrested for putting up a flyer also, probably for the Non-Dairy Screamers. Great times indeed.